Erleben Sie Elk View, ein luxuriöses Privathaus in Colorado, auf 7550 m Höhe, im erstklassigen Skigebiet Beaver Creek im Vail Valley. Diese spektakuläre 7.000 + sq. Ft. Colorado Mountain Home befindet sich am Ende einer Beaver Creek Cul-de-sac. Es ist das perfekte Hochland für eine große Familie, Skiurlaub, Sommergolf oder Corporate Retreat. 7 Schlafzimmer oder 9 Schlafzimmer (mit Gästehaus). * 9 Schlafzimmer hat extra Nacht Gebühr. Siehe Preisdetails. 7 Schlafzimmer hat 8 1/2 Bäder; 9 Schlafzimmer hat 10 1/2 Bäder. 7-8 Personen Beachcomber Hot-Tub auf dem 2500 qm großen Deck neben dem dritten Grün des Beaver Creek Golf Course. 3 separate Wohnbereiche bieten hochwertige private Räume. Luxuriöse Master-Suite mit 2-Wege-Kamin, Wohnzimmer, persönliche finnische Sauna, private Dampf / Dusche und Terrasse. Formeller und ungezwungener Speiseraum mit Platz für bis zu 22 Personen. Für den Fall, dass Sie mehr Gäste im Haus haben möchten (außer denen, die zu Hause wohnen), sollte dies vom Eigentümer zur Diskussion / Genehmigung angefordert werden. Dies unterliegt Ereignisgebühren. Das Wohnzimmer verfügt über die größte Wohn Kaminofen in Vail / Beaver Creek. 8-Personen-finnische Sauna; 6-Personen-weiß gefliesten Dampfbad, beide mit Blick auf die Berge. Wi-Fi im ganzen Haus und Decks. 3-Flammen-Thermal Engineering Corp Grill mit 45.000 Gasstrahlen. 8 1/2 Bäder in 7 Schlafzimmer. 10 1/2 Bäder in 9 Schlafzimmer (einschließlich Guest Home). Beautiful large home; sleeps up to 16. Plenty of bathroom space as well. 5 to 10 minute shuttle ride to Beaver Creek mountain; shuttle picks you up at the end of the driveway. Well equipped, large kitchen and large dining area that accommodates up to 20!. 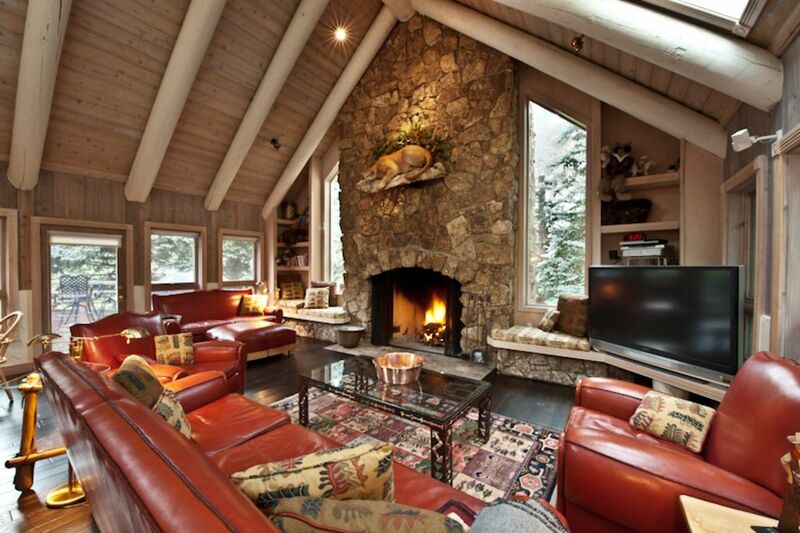 Large living room perfect for après ski gatherings. The listing description is spot on and features a 3D fly-through and floor plans for each level, unique features that give you an accurate impression of what the home has to offer. The home, it feels like a home, not just a place to stay while you visit Beaver Creek, is clean and well maintained. The owner and local host are great to work with. In fact, when I mentioned to the owner that we'd like a way to play music using a bluetooth connection, she immediately ordered the needed speaker and had it delivered on the same day! We are a fairly large group of college classmates who have visited many western ski areas over the past 25 years. We've stayed in many large homes over the years and Elk View was, without a doubt, among the best if not the best. We visited Beaver Creek to ski and this year the snow was spectacular! One evening we invited Home Chefs of Vail (recommended by the owner) to prepare a meal in house. The food and service were excellent. I would definitely recommend Elk View to a friend or relative. In fact, one of our group suggested that we return to Beaver Creek next year and stay again at Elk View. We'll be back. Our party of 17, 8 adults and 9 children, arrived to an immaculate property and excellent reception by the property manager. All amenities were fabulous and hot tub, sauna, steam, repeat, is highly recommended. The house had ample room for all of us and was well stocked with towels, kitchen supplies, etc. We chose to dine in most nights to fully take advantage of the homes lounge space, kitchen, and wine cellar. The shuttle service from driveway to the base is a major bonus. Looking forward to a repeat! This is an amazing family dream home vacation. Plenty of room for everyone! Amazing amenities and service. Attentive owner makes this property even more attractive. Would highly recommend for families or a large group of friends. Easy to get to BC Village or Avon. Perfect House for Family Trip! Had a great experience! Beth and the management team tended to all of our needs and had the house fully stocked with groceries upon our arrival. The kids loved discovering all the nooks in this house, and it's the perfect house for large groups because of all the bedrooms and sitting areas. Kitchen and Dining area was great for big meals. Felt as if we were at home and entertaining! Highly recommend! We had 9 adults and 8 kids and had plenty of space in the main house. The kitchen is open to the living areas and well-situated between the main living area and dining areas. There are two huge dining tables so kids can eat at one table and adults at the other. But a pickup at the house can be set up at any time. The owner Beth went above and beyond in ensuring our comfort during our stay and was always available for any issues, as was the property manager. We really enjoyed our time at the house! Die Vail Valley ist eine wunderbare Erfahrung warten auf Ihre Entdeckung in Colorado. Schöne Landschaft, reiche Aktivitäten für Outdoor-Enthusiasten, und konkurrenzlose Restaurants und Boutiquen zu kombinieren, um die ultimative Colorado Rocky Mountain Wochenende jeder Zeit des Jahres zu schaffen. Sehenswürdigkeiten der Umgebung gehören Skifahren und Langlaufen, Rodeln, Motorschlitten fahren, Wandern, Biken, Klettern, Golf, Tennis, Racquetball, Basketball, Fitness-Center, Fitnessraum, Fischen, Jagen, Tierbeobachtungen, Reiten, Schwimmen, Rafting, Shopping, Restaurants , Theater, Kinos. Angebotene Leistungen: Persönliche kostenlosen Transport in ganz Beaver Creek und Avon (von Dorf Transport zur Verfügung gestellt), Pre-Arrival Lieferung der Vermietung Ski und Lebensmittel / Spirituosen, tägliche Zimmerreinigung. The Guest Home is also available with 2 bedrooms/2 bathrooms, full kitchen, livingroom and deck. It has an additional rate of $625/nt. Winter and $450/nt. Summer. A cleaning fee of $650 applies per stay for the main home and $350 for the guest/carriage home. Taxes include tax & fee as follows (applied to the rental price of main & guest/carriage homes as applicable): (~14.5%): CO sales tax county + Eagle County + BC Civic & Lodging Assessment + Booking fee. In the case that you would like to have more guests for an organized visit in the home (beyond those staying at the home), this should be requested of the owner for discussion / approval. This is subject to a $1,000 event charge. Event charges also apply to use of the home for events (i.e. corporate meetings, special parties like wedding groups, birthdays, anniversaries). Mid-stay housekeeping services are available; please request more details. Please see direct web site www.ELKVIEW.COM.